What Modern Car Would You Use For A Demolition Derby? Demolition derbies are usually a slight detour for well worn older cars between the end of their usable life and a trip to the crusher. This weekend we want to know what would happen if the opposite were true and derbies somehow became the territory of brand new cars. Putting aside the obvious financial reality of using a brand new car for the sole purpose of a few hours of destruction, what new car would you pick to smash up your competitors? While the choices are unlimited, you're only going to be able to use it for the purpose of destruction (no post race parts harvesting or potential to rebuild it). Would you pick the best car for the job, the one most likely to keep yourself safe from the field of drivers trying to smash into you or just a car that for whatever reason you would find extremely satisfying to completely destroy? What modern car would you use for a demolition derby? 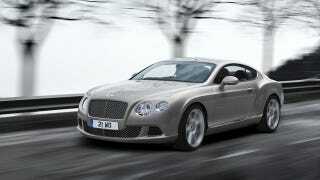 I'm using a new Bentley Continental GT to enter the new car demolition derby. Although it's the new and betterContinental GT twin-turbo V8 that is making all the news, I'm opting for the W12 version because of the engines extra weight and slight power advantage. With the Continental GT's AWD I should be able to get excellent traction on the muddy derby field and it's certainly large enough to take some hits. Perhaps most importantly something about the idea of destroying one of the ultimate high dollar automotive status symbols just for kicks sounds like a lot of fun. Hat tip to Bangarang for submitting this question!